“Great, now I can go after Horseface and her 3rd rate lawyer in the Great State of Texas,” President Trump wrote. President Trump called Stormy Daniels “horseface” in a tweet on Tuesday morning as he reacted to a judge’s dismissal of a defamation lawsuit the adult film star brought against him earlier this year. ?Federal Judge throws out Stormy Danials lawsuit versus Trump. Trump is entitled to full legal fees.? @FoxNews Great, now I can go after Horseface and her 3rd rate lawyer in the Great State of Texas. She will confirm the letter she signed! She knows nothing about me, a total con! Trump’s highly personal insult comes as he and his party are struggling to earn the support of women three weeks before a crucial midterm election contest that could alter the balance of power in Congress. A recent CNN poll found that 63 percent of women surveyed said they’d vote for the Democratic candidate in a generic ballot matchup, while only 33 percent said they’d vote Republican. Trump has been criticized for his past personal attacks on women who have criticized him, often referencing their looks. Last year, Trump was condemned by politicians on both sides of the aisle when he claimed that MSNBC host Mika Brzezinski was “bleeding badly from a face-lift” when she visited his Mar-a-Lago estate. In 2016, Trump suggested at a Florida rally that the crowd should consider the appearance of Natasha Stoynoff in weighing her accusation that he sexually assaulted her. “Take a look, you take a look. Look at her, look at her words, you tell me what you think. I don’t think so,” he said. Around that same time and also at a campaign rally, he denied the accusations from another woman who has accused him of sexual misconduct, also by suggesting she was not attractive enough. “Believe me, she would not be my first choice, that I can tell you,” he said of Jessica Leeds. Again in 2016, Trump said then-Fox News host Megyn Kelly had “blood coming out of her wherever” during a presidential debate in which she brought up his history of attacking women’s looks. He reposted a photo of Republican Senator Ted Cruz’s wife, Heidi, that compared her unfavorably to his own wife, Melania. Trump also disparaged the looks of Carly Fiorina, a former GOP primary campaign rival, according to a 2015 Rolling Stone profile. WASHINGTON — As Democrats get organized for the 2020 election, one major obstacle is becoming starkly clear: President Trump’s $100 million head start. More than half of the money the committees raised in the most recent fund-raising quarter came from individual supporters, who are giving in amounts of $200 or less. 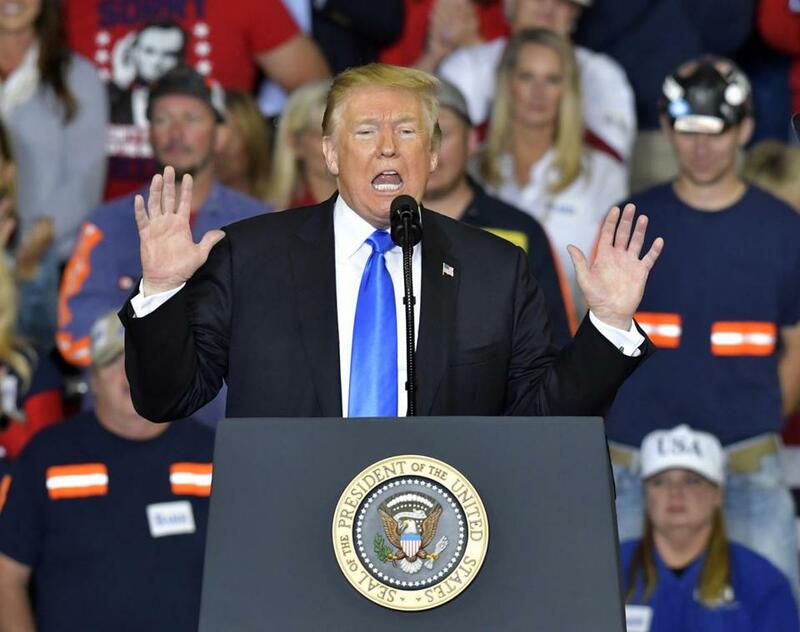 These supporters also are turning up at Trump-headlined rallies, where their information is being pulled into the Republican National Committee’s expanding voter database. WASHINGTON — President Trump on Tuesday offered a fresh threat to cut off aid to Honduras if a large caravan of migrants continues heading toward the United States. ‘‘The United States has strongly informed the President of Honduras that if the large Caravan of people heading to the U.S. is not stopped and brought back to Honduras, no more money or aid will be given to Honduras, effective immediately!’’ Trump said on Twitter. The group has swollen in size since leaving San Pedro Sula, one of the world’s most dangerous cities, on Friday. Its travels were prominently covered Tuesday morning on ‘‘Fox & Friends,’’ a program that Trump regularly views. According to the Fox News report, the number of people in the caravan doubled in recent days to 3,000.